This stockpot is made of heavy-gauge, reinforced aluminum for additional durability and dent resistance. With an enormous 140 qt. Capacity, this stockpot is perfect for steaming up a large quantities of soup or stew. A tall and narrow shape further enhances your cuisine by allowing liquids to bubble up through the length of the pot, diffusing flavor throughout the food. Aluminum construction is measured at 6mm thick, which makes them especially suited for high-volume use. Additionally, they are composed of heavy gauge reinforced aluminum, which offers superior thermal conductivity along with long lasting performance to withstand problems that occur during ware washing, storage, and constant heating! The reinforced handles allow for easy transportation throughout your kitchen or dining space. Capacity available from 16 qt to 160 qt. Capacity D X H. 16 qt 4.00 mm 11 1/8″ x 10″. 20qt 4.00mm 11 7/8″x11″. 24qt 4.00mm 12 3/4″ x 11 1/2″. 32qt 4.00mm 14″x 12 1/2″. 40qt 4.00mm 14 1/2″ x 14 1/2″. 50qt 4.75mm 16″x 15 1/4″. 60qt 4.75mm 17 1/2″x 16″. 80qt 4.75mm 18 7/8″x 17″. 100qt 4.75mm 20 1/4″x 17 3/4″. 120qt 6.00mm 19 1/2″x 19 1/2″. 140qt 6.00mm 22 3/4″x 20 1/4″. 160qt 6.00mm 22 3/4″x 241/4″. 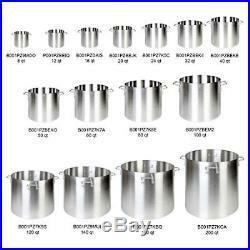 The item “Aluminum Stock Pots & Lids NSF Listed, 16 qt- 160 qt” is in sale since Saturday, November 24, 2018. This item is in the category “Home & Garden\Kitchen, Dining & Bar\Cookware”. The seller is “caydensupplys” and is located in Fresh Meadows, New York. This item can be shipped to United States, Canada, United Kingdom, Denmark, Romania, Slovakia, Bulgaria, Czech republic, Finland, Hungary, Latvia, Lithuania, Malta, Estonia, Australia, Greece, Portugal, Cyprus, Slovenia, Japan, Sweden, South Korea, Indonesia, Taiwan, South africa, Thailand, Belgium, France, Hong Kong, Ireland, Netherlands, Poland, Spain, Italy, Germany, Austria, Bahamas, Israel, Mexico, New Zealand, Philippines, Singapore, Switzerland, Norway, Saudi arabia, Ukraine, United arab emirates, Qatar, Kuwait, Bahrain, Croatia, Malaysia, Brazil, Chile, Colombia, Costa rica, Dominican republic, Panama, Trinidad and tobago, Guatemala, El salvador, Honduras, Jamaica, Viet nam, Uruguay.